Weber is applying its expertise as a leading manufacturer and supplier of pressure-sensitive labels to provide the finest in RFID smart labels. We call them SmartTrak. Our innovative method of inserting the RFID inlays fits seamlessly within our label conversion process. And because we manufacture the RFID smart labels ourselves, we're able to offer RFID media that will maximize performance and minimize costs. All SmartTrak RFID labels are produced using fully tested RFID inlays from trusted sources like Alien Technology, Avery and UPM Rafsec. Every label is certified and verified to be the highest in quality. 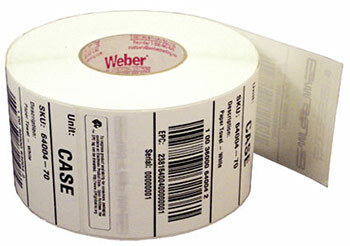 Weber is an expert at manufacturing labels. We use the latest high-speed flexographic presses to produce rolls of blank and printed pressure-sensitive labels and tags. 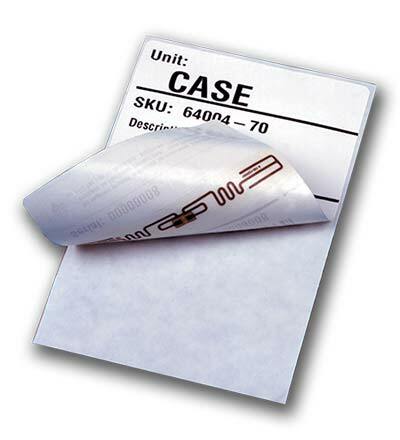 Our innovative method of inserting the RFID inlays fits seamlessly within that conversion process. And because we manufacture the RFID smart labels ourselves, we're able to offer RFID media that will maximize performance and minimize costs. All SmartTrak RFID labels are produced using fully tested RFID inlays from trusted sources like Avery Dennison, Alien Technology, and UPM Rafsec. Every label is certified and verified to be the highest in quality. Weber is a full-service, ISO 9001-registered labeling company. We do more than convert label material. We also are expert at recommending the right facestock and adhesive combination for a specific application. Our facestock materials are available in thermal-transfer and direct thermal papers, film and other synthetic substrates – all of which can be provided in custom shapes and sizes – along with high- or low-tack adhesives. 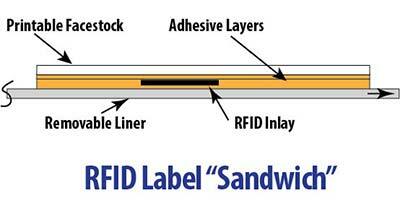 These are important considerations that can contribute to the overall success of an RFID smart label program. Also critical is the selection of the optimum RFID inlay. We can help you determine which inlay will deliver the best performance for the intended application. And we'll guarantee its performance. Learn how a team approach and Weber RFID smart labels helped a DVD/CD distributor meet a challenging RFID initiative. When chosing an RFID label and inlay, there are a couple of things to consider when trying to maximize your RFID read-performance. A larger RFID inlay will usually give you a longer read range. Various manufacturers make their inlays available in different strengths and sizes to fit your need. Weber can help you decide which type of inlay will work for your application. What type of RFID reader/scanner will you be using? Readers are available in hand-held, fixed position and overhead types and each performs differently. The inlay must be able to broadcast to the nearest reader to be successful. The readability of your inlay will be reliant on how your product is packaged. What type of surface is the label applied on? Corrugated, glass, metal, plastic, concrete, liquid-filled? Each of these materials will give you a different read so testing would be advisable. Also, if you stack multiples of your product on pallets or within other packaging, your RFID readability can be affected, too.